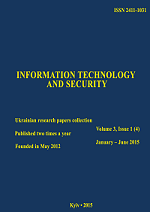 Collection "Information technology and security"
Home > Collection "Information technology and security"
“ Information Technology and Security” – scientific publication of the Institute of special communication and information protection of National technical university of Ukraine «Igor Sikorsky Kyiv polytechnic institute» for the publication of basic scientific results of dissertations and scientific papers by candidates scientific degrees and academic titles , also as higher education in the educational qualification of Master degree. After one year pause resumed in 2015. Register: certificate of state registration of the print media on 30.08.2011 HF 18225-7025P. Publication type: collection of research papers. Languages: Ukrainian, Russian or English (multi languages). Sphere of distribution: nation-wide and international . Categories of readers: scientific, pedagogical and engineering and technical staff , graduate students, doctoral students , students and kadets. Thematic focus: publication of original and review papers on the major problems of modern information technology, information security, information warfare, countering the use of social engineering, cyber security, the security of critical infrastructure, mathematical and computer modeling, the protection of information in telecommunication systems and networks (including on the protection of personal data), information security management and security risk information. Editor in Chief: Ihor Subach, doctor of technical sciences, associate professor; Institute of special communication and information protection of National technical university of Ukraine «Igor Sikorsky Kyiv polytechnic institute», Kyiv , Ukraine. Executive Secretary: Vasyl Tsurkan, candidate of technical sciences; Institute of special communication and information protection of National technical university of Ukraine «Igor Sikorsky Kyiv polytechnic institute», Kyiv , Ukraine. Technical Secretary: Valeriia Pokrovska; Institute of special communication and information protection of National technical university of Ukraine «Igor Sikorsky Kyiv polytechnic institute», Kyiv, Ukraine. Responsible Department: Cybersecurity and application of automated information systems and technologies. Editorial address: Str. Verkhnokliuchova, 4, Kyiv, 03056, Ukraine.